It’s almost time for our readers’ favorite fashion bargain event — the Ladies Designer Brand Warehouse Sale — April 28-30! The direct from the designer sale will feature Sharon Young’s 2016 Spring collection, plus many other designer clothing brands like Ali Miles, Tru Luxe, Multiples, and more. This huge sale only opens its doors to the public four times a year, and features thousands of fashion pieces, all at deep discount prices. You’ll find everything marked down 50% to 75% OFF retail and sizes to fit just about anyone ~ from petite to women’s sizes and everything in between. Pssst… There will be a special Buy One Get One Free offer on Thursday & Friday (April 28 & 29) only ~ be sure to ask about it! We will be heading over to the sale in a few days to give you a sneak preview and post some “Insiders’ Scoop” pics and info — stay tuned! In the mean time, save the date April 28-30 (Thursday to Saturday), get your shopping list ready, and look forward to more photos to come! Just a little reminder that the Sharon Young & Ladies Designer Brand Warehouse Sale opens its doors to the public this Thursday (Feb. 4-6)! We popped over for a preview and found SO MANY great finds. As promised, we are sharing some of our favorite bargains — even lots of insider tips you’ll want to know before you go! This direct from the designer sale only opens its doors to the public four times a year, and the sale runs this Thursday to Saturday, February 4 to 6. Everything is deeply discounted OFF retail (prices starting at $20), and you’ll find a variety of styles and sizes to fit just about anyone. Insider Tip #1: For the best selection, go to the sale as soon as you can. Some styles/sizes are limited in quantity and sell out fast — the earlier you can go, the better. Insider Tip #2: There will be a surprise “Buy One Get One FREE” deal you’ll want to ask about (note that this is offered on Thursday and Friday only). Insider Tip #3: The sale offers wonderful statement pieces and wonderful wardrobe basics too. 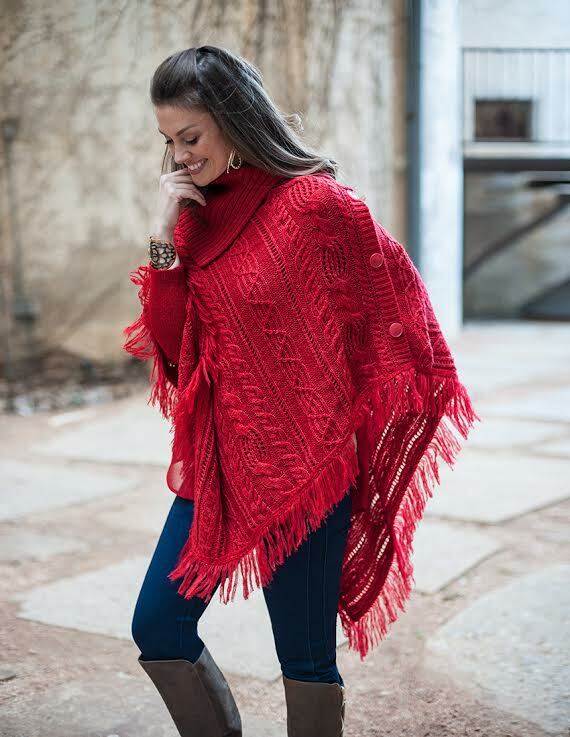 Be sure and look for reversible and convertible styles to stretch your wardrobe (like the fantastic blue and black poncho above that can be worn 3 different ways, providing several looks from this one piece – LOVE!). 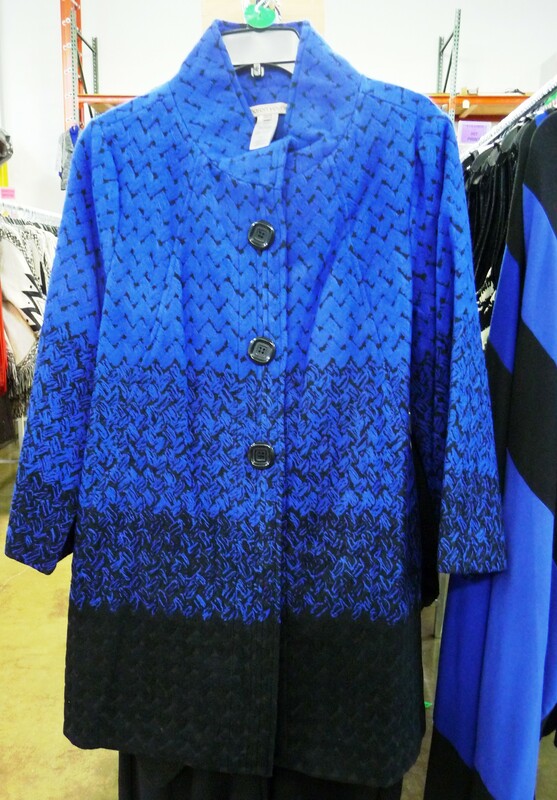 We found lots of fabulous finds including the reversible black and white brocade poncho below AND a reversible pair of tailored knit pants (Yes ~ reversible pants!) from Sharon Young — solid black on one side and reverses to heather gray on the other — savvy travel-worthy and so comfortable too! Insider Tip #4: There are sizes to fit and flatter just about everyone — you’ll find Petite size 2 to Women’s Plus sizes and everything in between. A special note on sizes — if you know anyone looking for fashion-forward Women’s plus sizes, be sure and bring them with you to this February sale! We saw TWO, very long rows dedicated to wonderful plus-size fashions (that’s a few thousand 0X-3X pieces from which to choose)! Insider Tip #5: Almost everything throughout the sale is grouped by collection, making it easy to find coordinating pieces and mix-and-match a complete outfit. Insider Tip #6: Be sure and look for the big section of our favorite “Slim-Sation” pants and tights (you’ll find them pretty close to the center area of the sale). 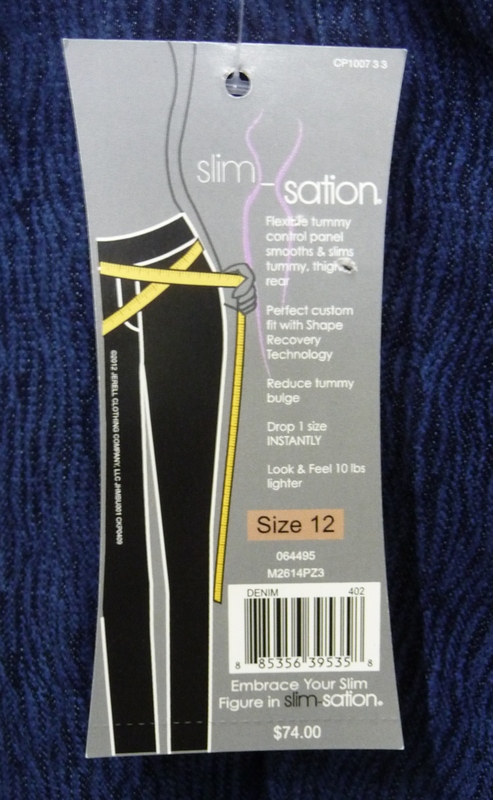 Slim-sation pants have a little inside tummy smoothing panel that make you look a size smaller (yes, please!). These have become our “go to” favorites as they are no-fuss machine washable, comfortable, and have a fantastic fit. Pssst…Slim-sation is the same line of pants carried by a high-end travel clothing/online catalog store for almost TWICE as much as you’ll find them at this sale. We can’t reveal the name of the store, but doing a little Google search might tell you (wink-wink). Insider Tip #7: Look for the section of Tru Luxe jeans, crops, and casual tops –– these high-end jeans are very deeply discounted to at least 60% off retail ($40 at this sale vs. the usual $100 price tag at retail stores)! We appreciate that the Tru Luxe jeans section is organized by size, making it simple to find the right pair and fit among the many style choices. Insider Tip #8: There are over 19,000 pieces in this sale at 50% to 75% off retail, so wear comfortable shopping shoes! 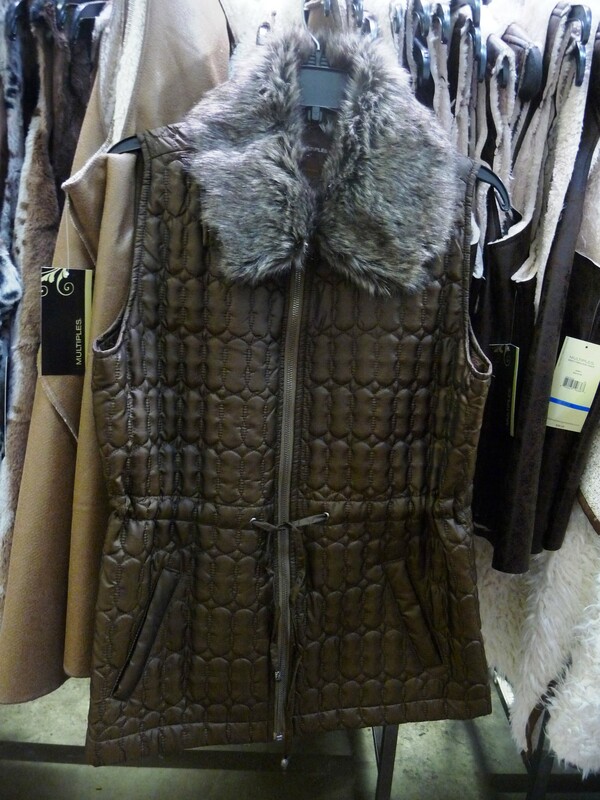 You’ll find tops, skirts, pants, and jackets from boutique quality and high-end department store designers. 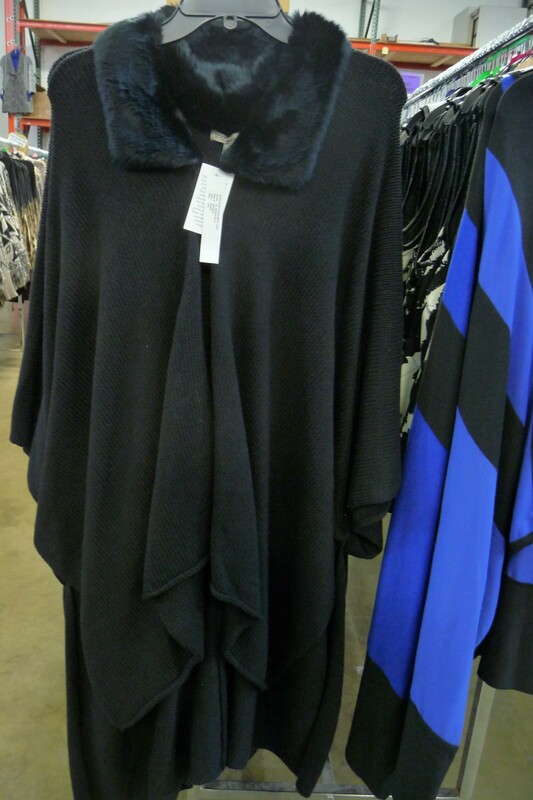 Look for favorite designer brands like Sharon Young, Tru Luxe, Ali Miles, and Multiples ~ prices start at $20 and nothing is over $60. 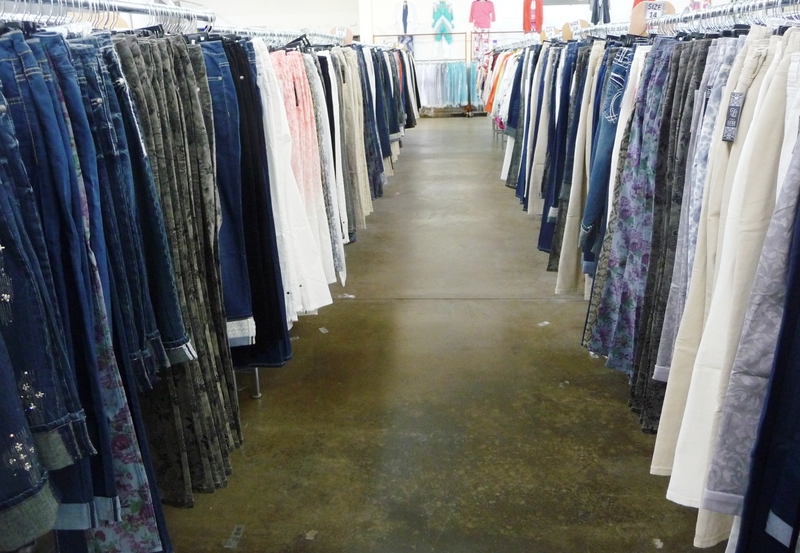 I hope you have a little taste of the sale and are able to make the jog over to Dallas to grab some great bargains, too! Ohhhh…you are going to love the latest Ladies Designer Brand Warehouse Sale, our readers’ favorite fashion sale! We just finished our sneak peek look and have lots of pictures and finds to share with you below. Once again, the sale is packed with over 22,000 fantastic designer fashion bargains starting at $20, plus special “Buy One Get One FREE” deals (AND a FREE gift with a Tru Luxe jeans purchase) on Thursday and Friday. 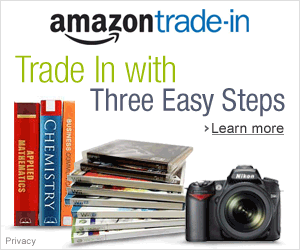 Doors open to the public this Thursday and the sale runs April 30 to May 2! 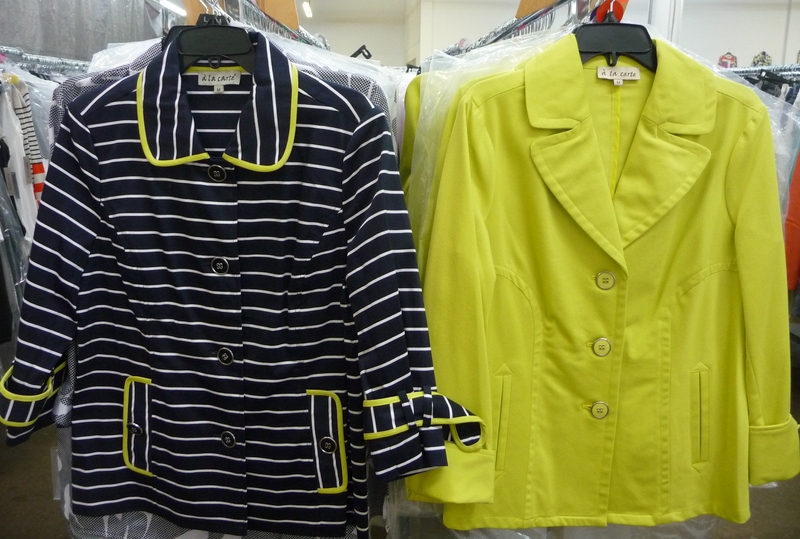 :: The direct from the designer, Sharon Young & Ladies Designer Brand Warehouse clothing sale only opens its doors to the public four times a year, and the sale runs this Thursday to Saturday, April 30-May 2. Everything is deeply discounted OFF retail, and you’ll find sizes to fit just about anyone — from petite to women’s sizes and everything in between. 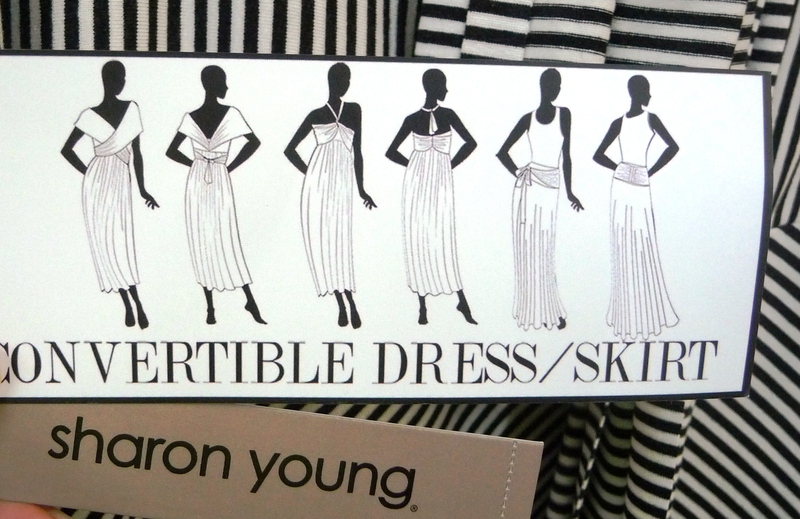 :: We found several wardrobe essentials including this convertible maxi skirt from designer Sharon Young. It can be turned into a summer dress and worn lots of ways to get several looks & uses from this one piece! 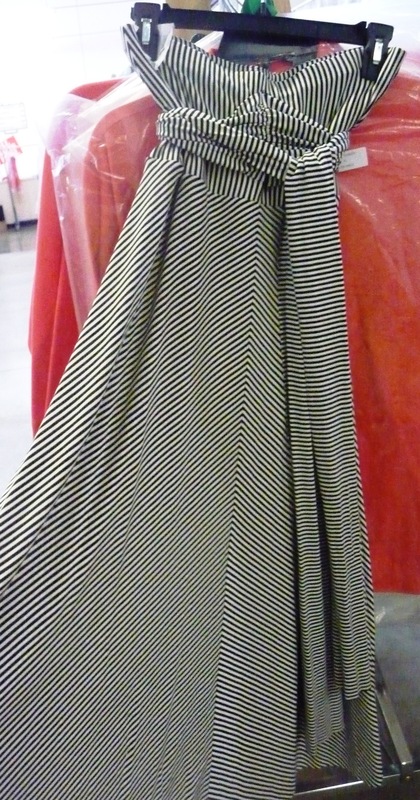 This discounted to $40 striped skirt even comes with an attached sash and a little style idea guide to get you started. We included a picture of the guide below so you could see some of the styles that can easily be made from this single skirt/dress — a perfect summer travel piece! :: Almost everything throughout the sale is grouped by collection, making it easy to mix-and-match a complete outfit. Isn’t this navy and lime green collection sharp? 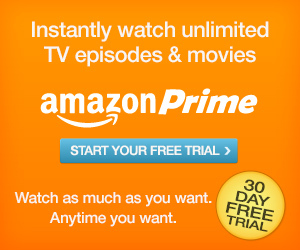 :: There are over 22,000 pieces in this sale at 50% to 75% off retail. 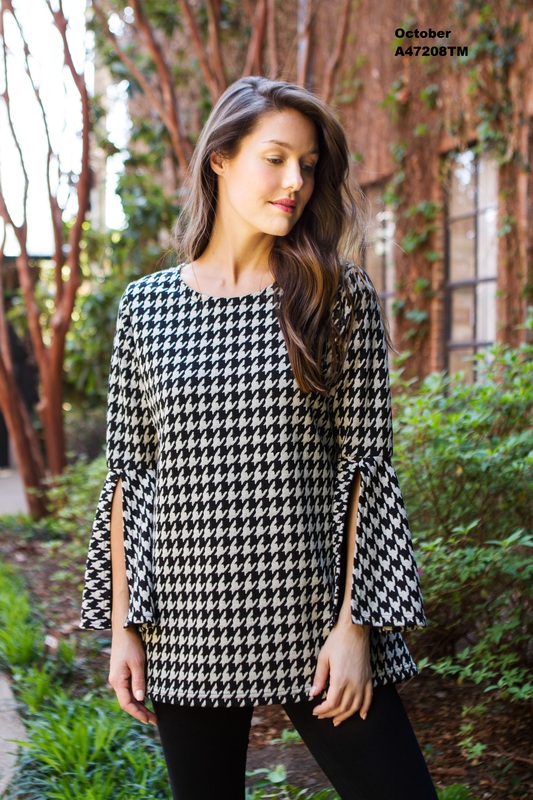 You’ll find tops, skirts, pants, and jackets from boutique quality and high-end department store designers like Sharon Young, Multiples, Tru Luxe and City Girl ~ prices start at $20 and nothing is over $60. :: We found 1000s of our favorite “Slim-Sation” pants and crops. These have a little inside tummy smoothing panel that make you look a size smaller (yes, please!). These have become our new “go to” favorites — they are comfortable and have a fantastic fit. Be sure and look for the Slim-Sation tag below. :: There are row after row of trendy Tru Luxe jeans, crops, and lots of fun Tru Luxe casual tops — we love the variety of jean styles and patterned fabrics offered in the Tru Luxe collection. 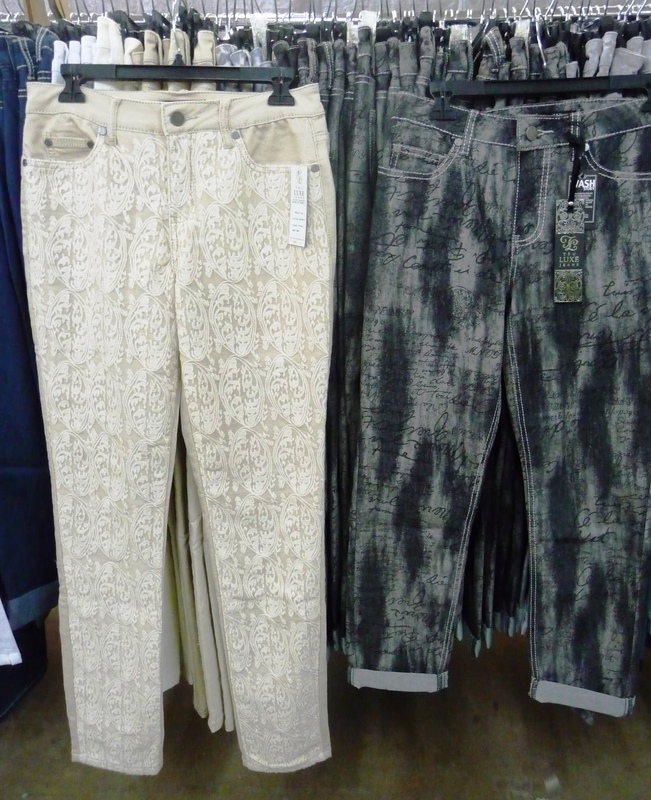 Plus these jeans are at least 60% off retail ($40 at this sale vs. the usual $100 price tag at retail stores)! As a side note, we really appreciated that the Tru Luxe jeans section of the sale is organized by size, making it simple to find just the right pair and fit among all the choices. 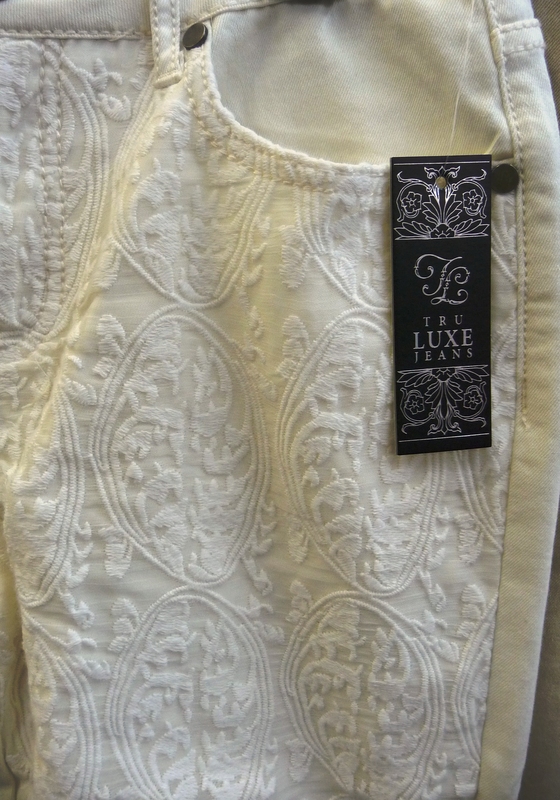 Click on the picture below to see a closeup of the wonderful lace brocade overlay detail on these “dress ’em up or down” straight leg Tru Luxe jeans. 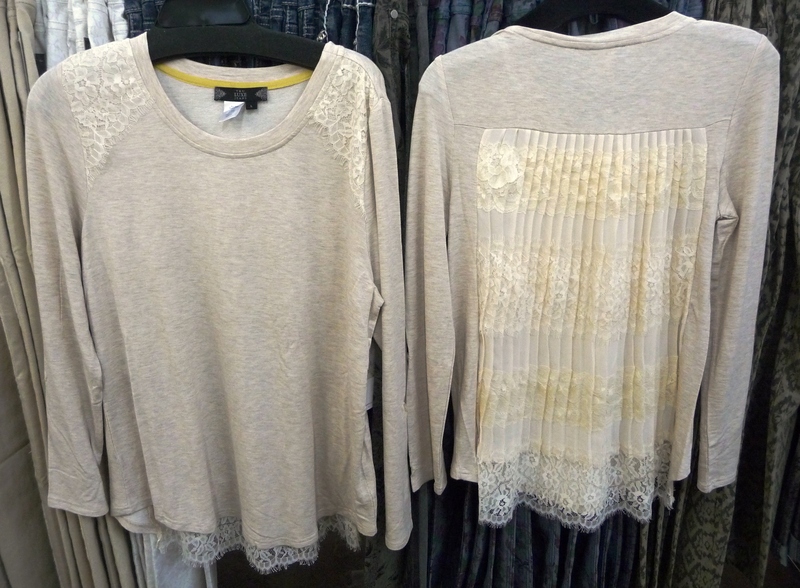 Take a look at the feminine lace detail on the back of this Tru Luxe light-weight knit top — so flattering and perfect with a pair of jeans! :: The sale covers a huge variety of styles, from trendy to classic and from “running to the grocery store” casual to night-on-the-town dressy. 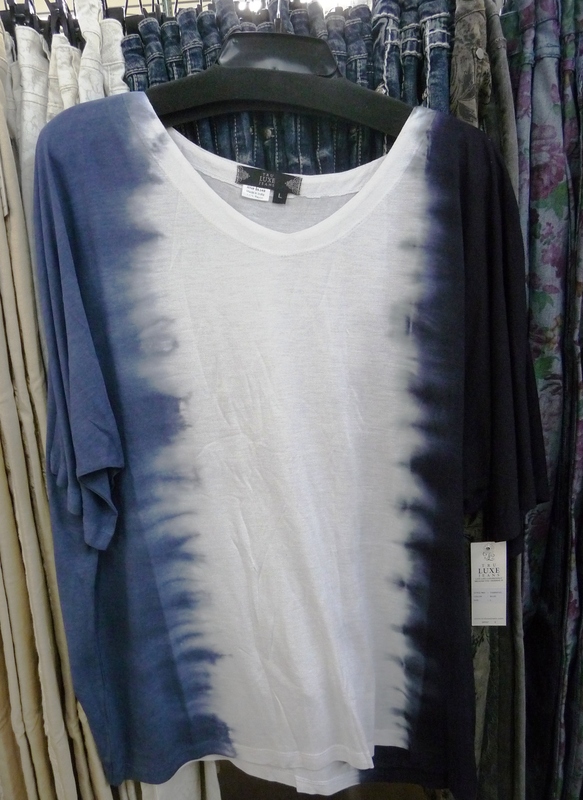 Plus, there is a nice choice of sizes to fit and flatter. 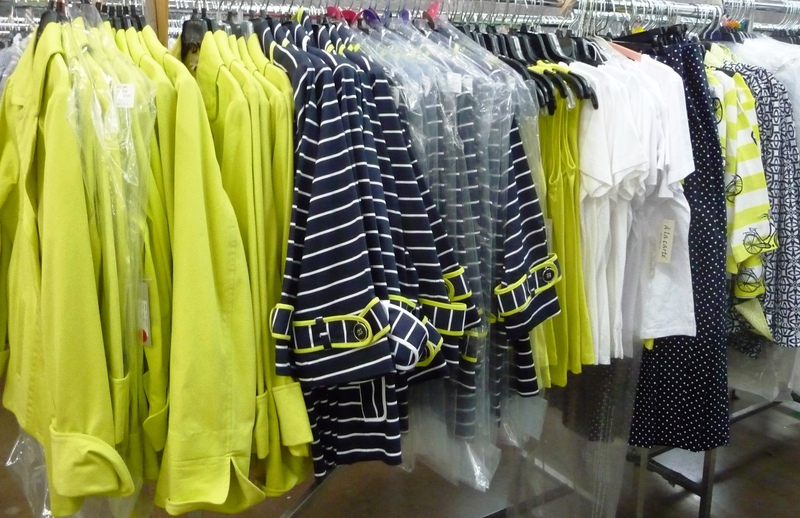 Sizes range from Ladies & Petites 2-18, and there is a large collection of Womens Plus 0X-3X. I hope you are able to make it over to the sale to check it out yourself and grab some bargains, too. Yay! It’s almost time for our readers’ favorite fashion warehouse sale! 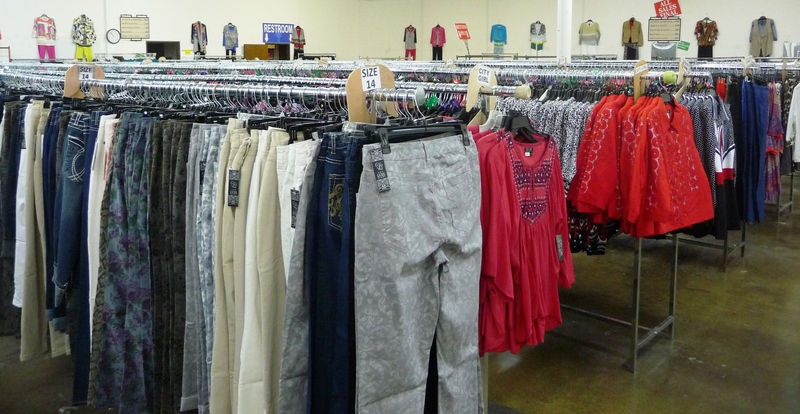 Be sure to save the date for The Ladies Designer Brand Warehouse Sale — opening its doors to the public, Thursday to Saturday (April 30 – May 2) with lots of designer clothing deals. 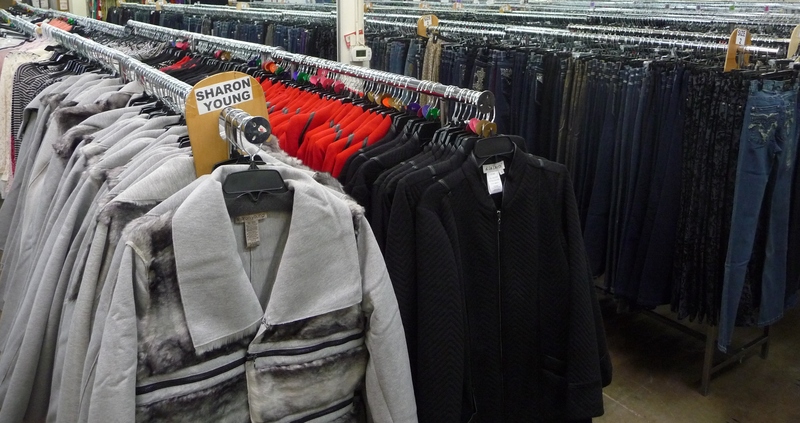 The direct from the designer Sharon Young & Ladies Designer Brand Warehouse clothing sale only opens their doors to the public four times a year and their next sale runs Thursday to Saturday, April 30 to May 2, 2015. The sale will be huge (over 18,000 pieces! ), and everything is marked down 50% to 75% OFF retail. You’ll find sizes to fit just about anyone ~ from petite to women’s sizes and everything in between. Stay tuned…We will head to Dallas to get a sneak look at the sale and share some of our favorite finds with you! In the mean time, be sure to carve out time on your calendar and save the date! 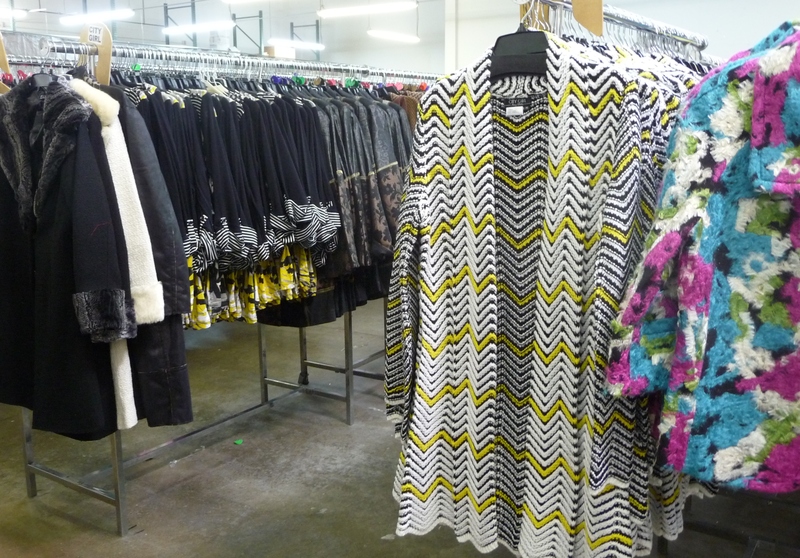 Just for our readers, we popped over to take a sneak look at the Ladies Designer Brand Warehouse Sale’s first public sale of the year (doors open this Thursday and the sale only runs February 5-7). Once again their sale is packed wall-to-wall with fantastic finds ~ over 18,000 pieces and nothing is over $60! 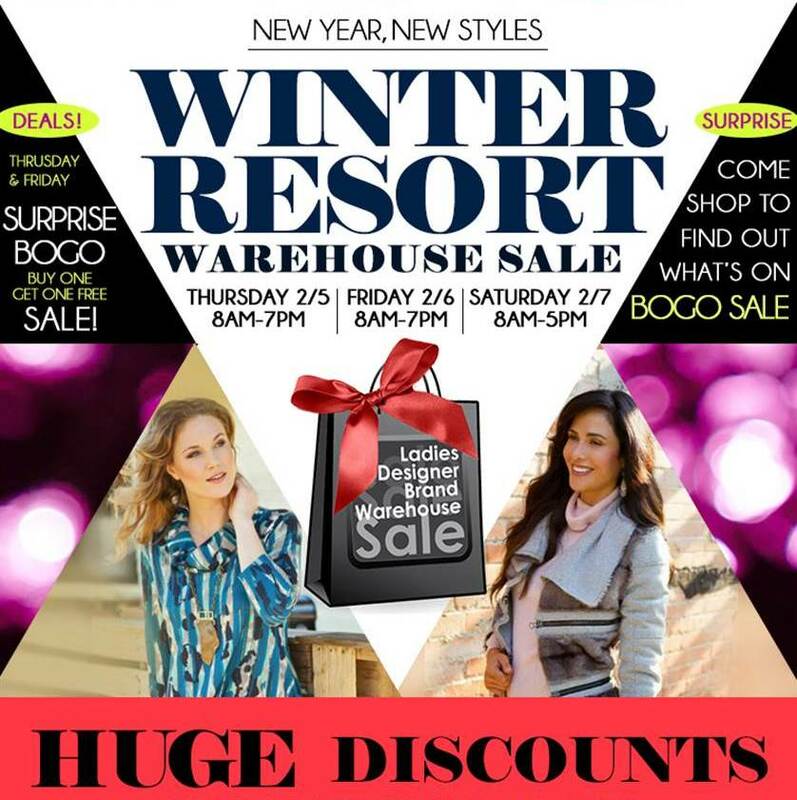 :: The direct from the designer, Sharon Young & Ladies Designer Brand Warehouse clothing sale only opens its doors to the public four times a year, and the sale runs next Thursday to Saturday, February 5-7, 2015. Everything is deeply discounted OFF retail, and you’ll find sizes to fit just about anyone ~ from petite to women’s sizes and everything in between. 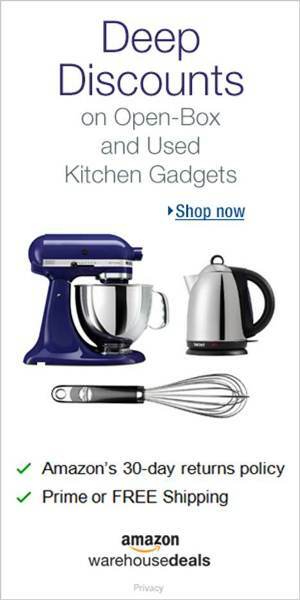 This month’s sale is huge with over 18,000 pieces and even more opportunities to save! Extra discounts will include a fantastic buy one get one FREE surprise deal on Thursday and Friday — this is on top of the already discounted prices! 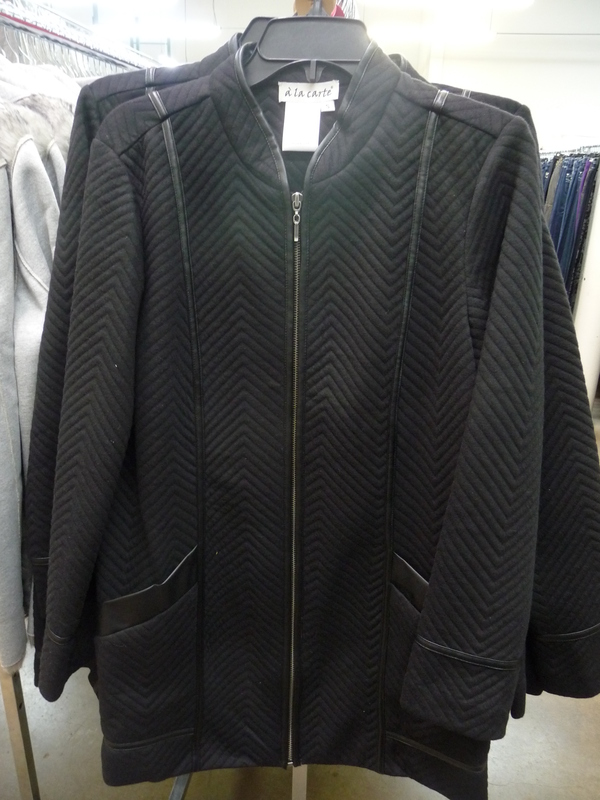 :: We found lots of lightweight jackets, sweaters, and tunics in fabulous fabrics, textures, and colors. :: We fell in love with these winter white lightweight jackets above (both look great with straight leg pants or jeans). 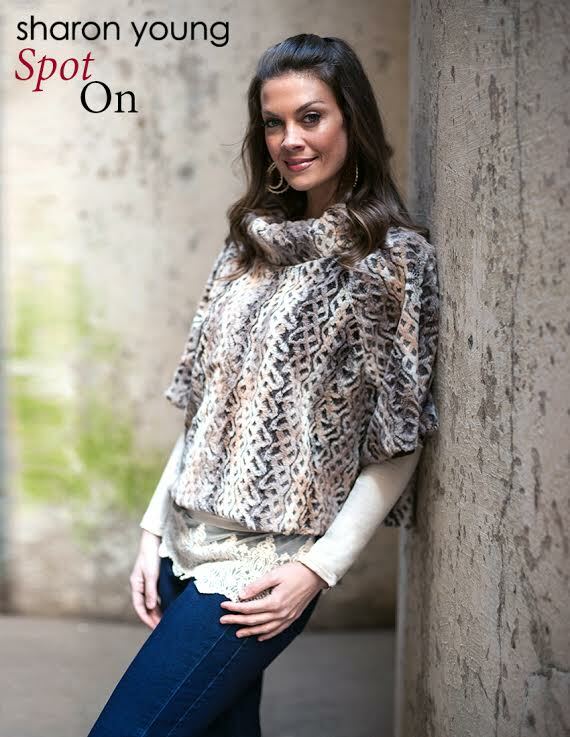 These are great transition pieces for moving from our mild Texas winter into the spring. 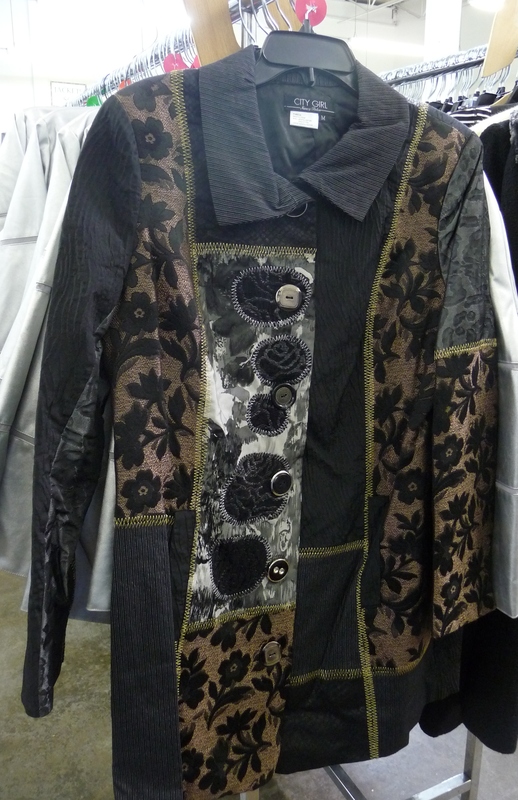 The jacket on the left has an amazing hand carved accent button, and the one on the right has beautiful top-stitched details on the collar and sleeves. :: You will see row after row of gorgeous embellished and plain pocket Tru Luxe jeans, jean jackets, and lots of fun Tru Luxe casual tops to complete your outfit. 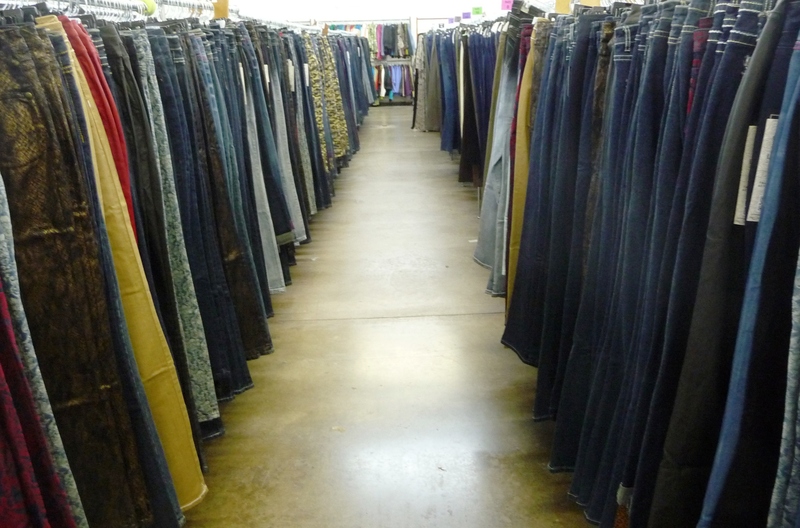 The variety is incredible and most of these jeans are at least 60% off retail! We found just about every jean style in a large choice of fabric patterns & colors — below is a sample of just a few of the styles in this week’s sale. :: The sale covers a huge selection and variety of styles, from from “running to the grocery store” casual to night-on-the-town dressy and from super trendy to classic favorites. 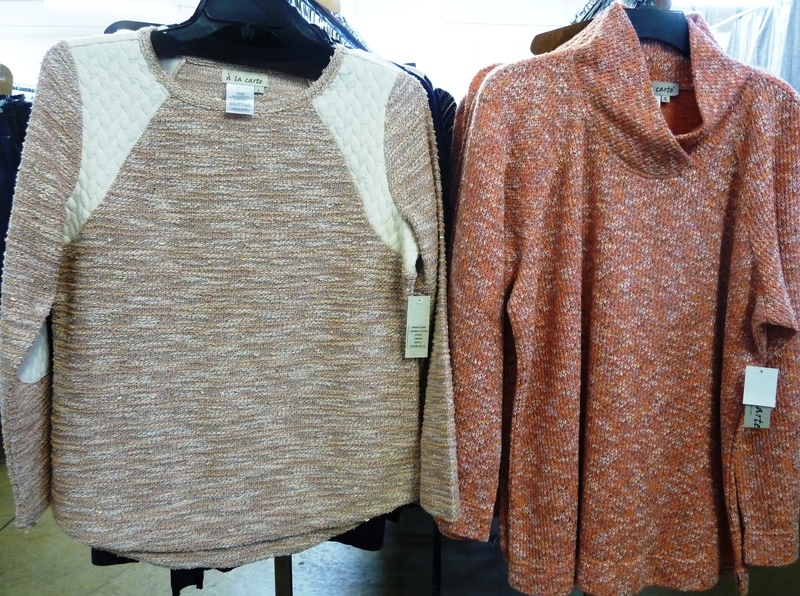 Plus, there is a nice variety of sizes to fit and flatter. Sizes range from Ladies & Petites 2-18 and Womens Plus 1x to 3x. :: Everything in this sale is 50% to 75% off retail. 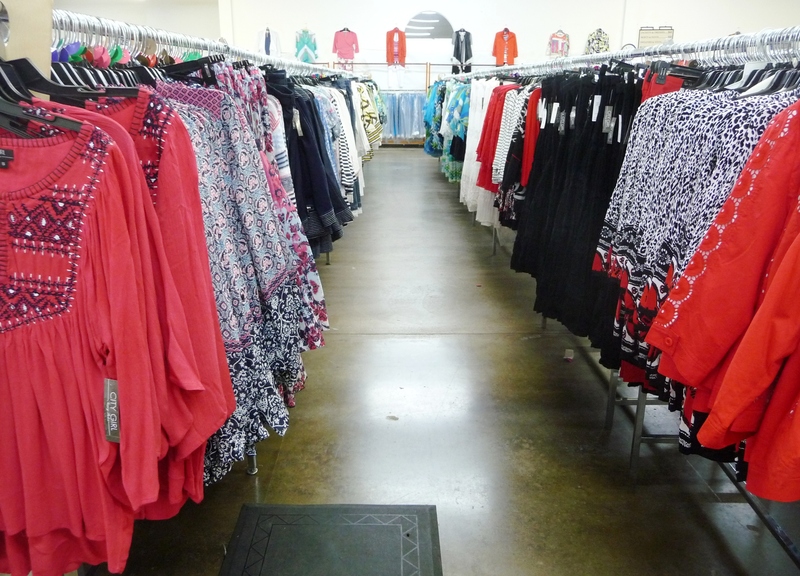 You’ll find everything you need to complete an outfit including tops, skirts, pants, and jackets from boutique quality and high-end department store designers ~ all $20 to $60. 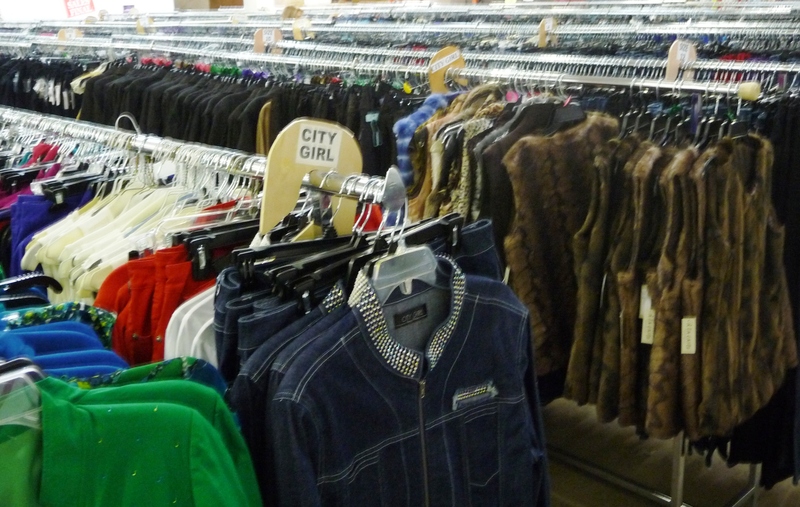 Secret Sauce Shopping Tips: You’ll find plenty of dressing room space provided for trying on all your finds, but typical of women’s fashion warehouse sales, it is ladies only, but not private. Since this is a women only event, men, husbands, guy-friends and kiddos under 12, please stay comfortable at home, as you will not be able to visit the sale. Also, they accept all credit cards, cash or checks.